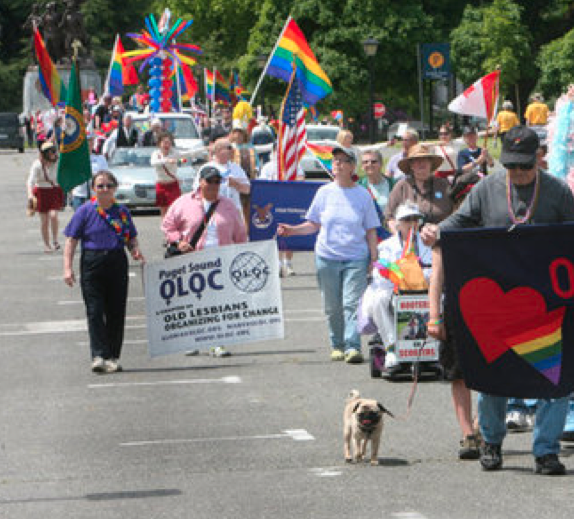 PS OLOC reaches out to find old lesbians within and beyond the Puget Sound area via various mechanisms, relying heavily on word of mouth, collaborative efforts with allied organizations, sponsorship of events, and more. Our efforts to reach isolated, “invisible” old lesbians in senior centers/housing, and retirement communities where the terms “lesbian” AND “old” are seldom welcome at the dinner table. Our outreach enables “out” lesbians to go to senior sites, join in on line dancing or pinochle, talk with seniors and directors, work to “buddy” with relatively closeted lesbians and welcome them- and their encouraging allies, possibly transporting them–into our community. PS OLOC focused on outreach to central and eastern Washington by our Across the Mountains (ATM) event in May, 2015. We enjoyed a glorious sunny day-long boat cruise on Lake Chelan, WA. Then we gathered to meet other regional women the following day in Wenatchee, WA. Mechanisms used for our outreach were email and phone contacts with Area Agencies on Aging, Women’s and Gender Studies programs, PFLAG chapters, UU and MCC churches, LC Contact Dykes, and Meetup.com.